As it turns out, killed by friendly fire. 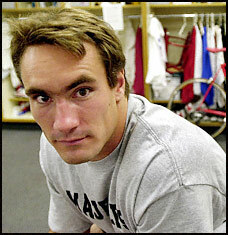 Pat Tillman, the Arizona Cardinals safety who forfeited a multimillion dollar contract and the celebrity of the National Football League to become a U.S. Army Ranger, was killed in Afghanistan during a firefight near the Pakistan border on Thursday, U.S. officials said yesterday. Tillman, 27, was killed when the combat patrol unit he was serving in was ambushed by militia forces near the village of Spera, about 90 miles south of Kabul, the Afghan capital. Tillman was hit when his unit returned fire, according to officials at the Pentagon. He was medically evacuated from the scene and pronounced dead by U.S. officials at approximately 11:45 a.m. Thursday. Two other U.S. soldiers were injured and one Afghan solider fighting alongside the U.S. troops was killed.